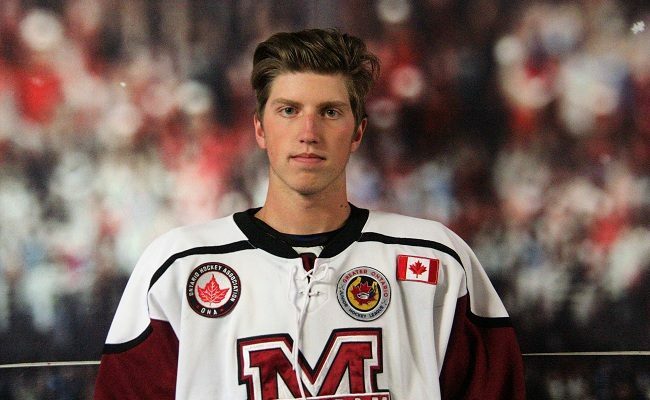 Dane Johnstone scored two goals in the Chatham Maroons’ 3-2 win over the Strathroy Rockets Sunday night at Memorial Arena. The Maroons gain two points on idle London in the GOJHL Western Conference standings. They now are in second place with 24 points. The Rockets are in last place with ten points. Strathroy got to hit the scoreboard first in this contest. Max Ewart, coming off a three-point game Saturday against Leamington, scored on the power play at 15:48 of the first period. The Maroons, however, scored back to back to take the lead before the intermission. Darby Lemieux scored the equalizer at 17:55, then Johnstone gave his team the lead 57 seconds later with his first goal of the game. Johnstone got his second goal of the evening in the middle frame to extend the Maroons’ lead to 3-1. The Rockets outshot Chatham 16-11 in the period. Strathroy got a goal back in the third when Michael Wood found the net on the power play at 4:55. Tristan Lewis faced 39 shots in goal for the Maroons and turned away 37 of them. Joshua Diamond notched 29 saves for the Rockets. Both teams are back in action Friday night. The Rockets will visit St. Marys while the Maroons head to St. Thomas. Puck drop for the latter game is scheduled for 7:30 p.m. and all the action can be heard on CFCO Country 92.9FM/AM 630.